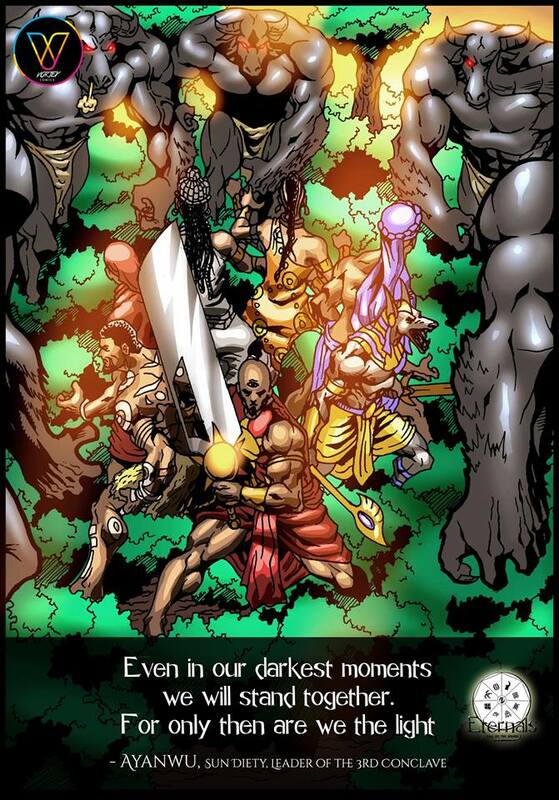 Vortex Comics are serious about exporting African culture though comics. It’s not hard to see why following the release of Eternals, the newest title in their repertoire. 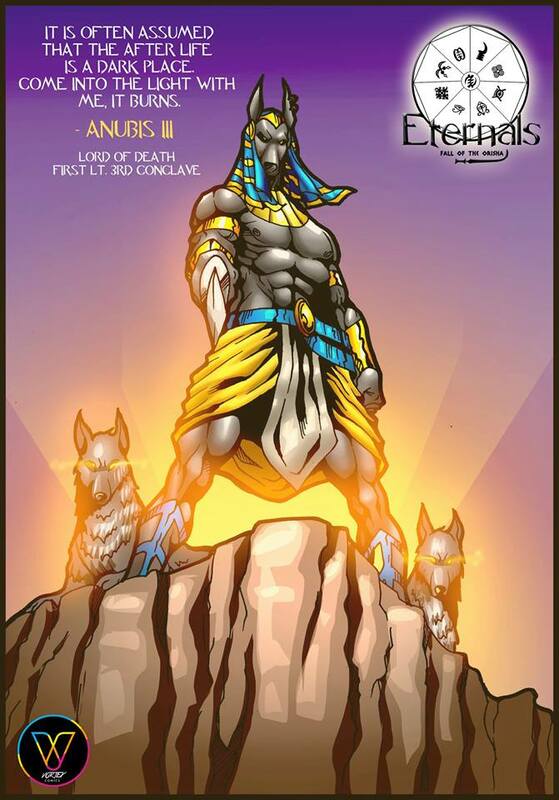 The first issue of Eternals is a soup of Egyptian, Malian, Nigerian and Ghanaian myths. 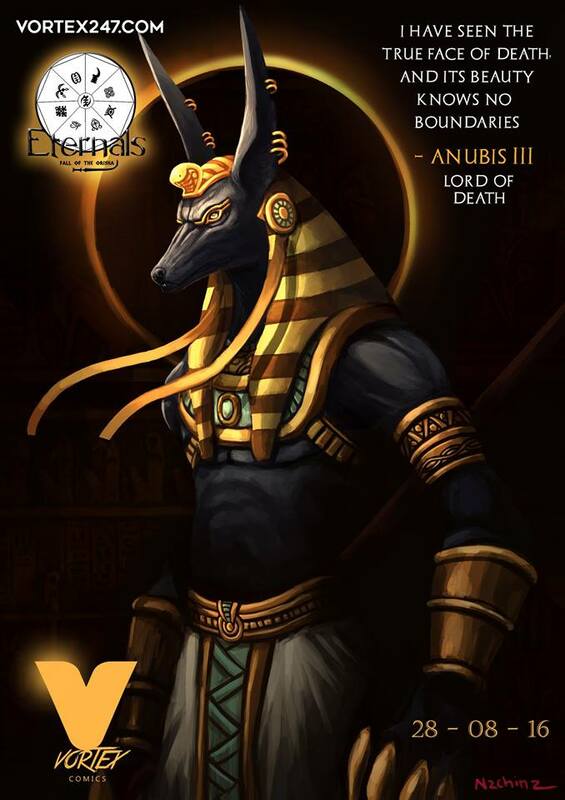 It features Anubis, Dongon (as a deity), Sango, and several gods divided into factions. Eternals follows the story of the newest faction rising – the third conclave – caught in an ongoing battle for supremacy between two powerful deities; Sango and Amadioha. Squid Mag team mates, Fafa, Yamakasi, Kadi and Elom share their thoughts on the latest offering below. This first issue of Eternals sets the world in which the story is established, we are introduced to the main characters and the dramatic conflict is well presented. Eternals gives a settled and deeper representation of African gods. I also find the costumes very relatable and true to Africa. I think Vortex is taking a gamble here on the setting, considering these are different cultures that developed at different times and unless we’re throwing historical accuracy out the window, might present a challenge in how these are represented. It’s also an opportunity for creative expression that promises to be interesting. On the matter of costume, no qualms. I do however find Ayanwu’s sun emblazoned t-shirt a tad too tacky and in your face. Yeah, you’re the sun god and leader of the third enclave but come on. The art isn’t so wild. It’s alright, but not wild. I think the art is worth applauding, the illustrations are decent. The promo art was wicked especially the one by Ionut. My excitement was mostly snuffed out reading however. I believe Vortex is grooming and evolving talent whose promo art matches finished work that will make me piss my pants in celebration. So the story wasn’t exactly clear to me because the captions were too cryptic and it’s hard to understand. It’s a bunch of clauses with no apparent correlation to me as a reader. It doesn’t particularly help either because I don’t know the gods. The comic tried, by listing their names in seating order from the conclave. But all that was said before that means nothing to me. I love the idea of carpooling gods across cultures. That’s quite the undertaking and I’m eager to see how Vortex pulls it off. However, I believe the story was condensed into this first issue. There’s obviously much to tell but it just seemed a bit much to process. Too many things happening and no room to breathe. While characters are essential, it seemed like too many to digest at once. I don’t understand anything I read. There’s a lot of hanging statements that I believe are related to the story but go over my head. First issues are supposed to leave the reader in post thrill packed suspense that would leave them counting down days to the next release. This one really fails at this. There’s no evident antagonist, no interesting back-story, nothing. Eternals strikes me because it happens to be the first comic I’ve read that brings together gods from different tribes/ethnicities across Africa. I believe this is a step towards a deeper integration of African communities through the unification of their respective beliefs. Eternals does what other projects like Leti Arts’ Africa’s Legends has done, but with a focus on the past. Whereas Africa’s Legends imagines deities of old as modern superheroes, Eternals imagines their exploits as they happened. I especially like the feminist portrayal of Ananse. Breaking away from the traditional male representation of the trickster and storytelling god, resonates with my upbringing in which I only remember my grandma telling stories. So that’s what we think. But don’t just take our word for it, see it for yourself. Sign up and read Eternals free of charge here. Leave a comment. Talk to us! Let’s hear your opinions too.